"A powerful call for reform." Mass incarceration will end--there is an emerging consensus that we've been locking up too many people for too long. But with more than 2.2 million Americans behind bars right now, how do we go about bringing people home? 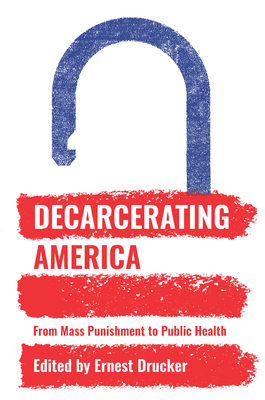 Decarcerating America collects some of the leading thinkers in the criminal justice reform movement to strategize about how to cure America of its epidemic of mass punishment. With sections on front-end approaches, as well as improving prison conditions and re-entry, the book includes pieces by leaders across the criminal justice reform movement: Danielle Sered of Common Justice describes successful programs for youth with violent offenses; Robin Steinberg of the Bronx Defenders argues for more resources for defense attorneys to diminish plea bargains; Kathy Boudin suggests changes to the parole model; Jeannie Little offers an alternative for mental health and drug addiction issues; and Eric Lotke offers models of new industries to replace the prison economy. Editor Ernest Drucker applies the tools of epidemiology to help us cure what he calls "a plague of prisons." Decarcerating America will be an indispensable roadmap as the movement to challenge incarceration in America gains critical mass--it shows us how to get people out of prisons, and the more appropriate responses to crime. The ideas presented in this volume are what we are fighting for when we fight against the New Jim Crow. Ernest Drucker is professor of Global Public Health at New York University's College of Global Public Health; adjunct professor of epidemiology at the Mailman School of Public Health at Columbia University; professor emeritus in the department of family and social medicine at Montefiore Medical Center, Albert Einstein College of Medicine; and visiting scholar at John Jay College of Criminal Justice, City University of New York. He is the author of A Plague of Prisons: The Epidemiology of Mass Incarceration in America and editor of Decarcerating America: From Mass Punishment to Public Health (both published by The New Press). Drucker is a founder of the International Harm Reduction Association, founding editor of Harm Reduction Journal, former chairman of Doctors of the World/USA, and a Soros Justice Fellow of the Open Society Foundation. He lives in New York City.